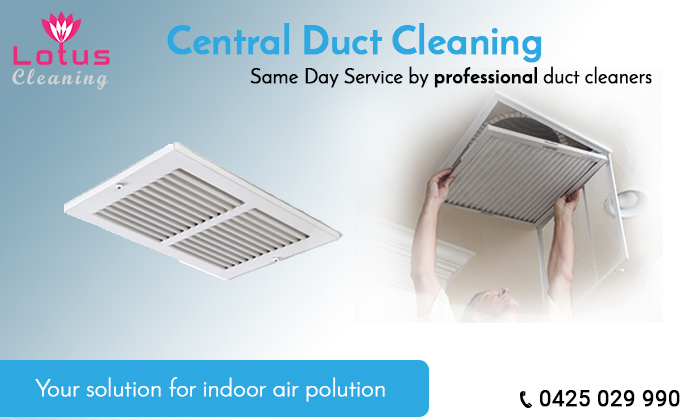 Duct Cleaning Frankston South provides best quality duct cleaning, vent cleaning and AC Duct Cleaning services at Lotus so call us right now on 0425 029 990. The indoor air quality is very much importance, it is the air we breathe in during the most time of the day. Getting your duct cleaned in order to make sure that every breath you take is fresh. 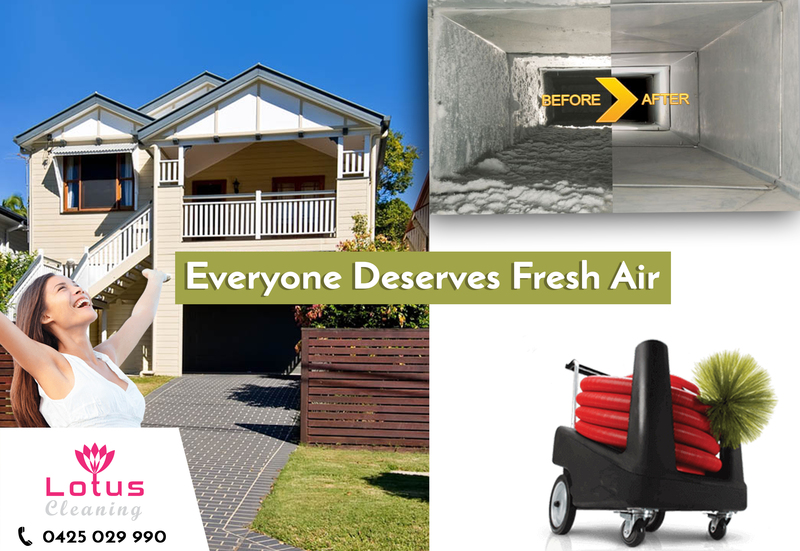 Getting your air duct cleaned is important to spend a healthy life and the quality of the air we breathe in is directly related to our health and therefore it is a necessity to get your air duct cleaned by Lotus Frankston South Cleaning. Note that fresh air can only be produced by clean ducts, the air we breathe in is supposed to be free from dust, dirt and other pollutants thus getting them cleaned from time to time is a definite must. If you are environment conscious then do not worry because we fulfill that objective as well we work with environmentally friendly products and equipment causing no harm to you and the outside world in any shape or form. Why does my duct need cleaning? Because it helps your furnace run better and more efficiently. It improves the cleanliness and quality of the air in your homemaking are safer and easier to breathe. And it minimizes dust in your home so you don’t have to clean so often.We recommend getting your furnace and ducts cleaned every year. If it’s been longer than that, or if you’ve never had a cleaning (many people haven’t) then you should probably get it done. You’d be surprised at the improvement it can make. How do we clean your AC Ducts? We will be cleaning your entire ventilation system which includes: HVAC unit, evaporator, Blower and all other accessible parts. Note that we will also be cleaning your vent covers by removing them carefully, then cleaning them and putting them back. All this without any damage. We will be leaving you when you are fully satisfied with our service and till your indoor air quality is improved. We will try to reach every corner of your duct and make sure we miss zero areas. We shall also be making use of professional equipment and when these materials are handled by experts it always brings good results. Reasonable Duct Cleaning Frankston South : $27 per duct including duct sanitizing and duct deodorizing and 10 ducts clean in just $270. We are available for 24/7 in Frankston South. For more queries as to why getting your duct cleaned feel free to contact us, we will be pleased to give you a detailed layout. Just call Lotus AC Duct Cleaning Frankston South on 0425 029 990 and we can schedule a visit for you! Lotus Professional Duct Cleaners Frankston South also an expert in Heating duct cleaning & Cooling Duct Cleaning, Duct Repair, Duct Installation, Duct Replacement and Duct Sealing, all technicians are certified and well trained to give you quality services in efficient manners. Our professionals will make recommendations about the best way to address any indoor air quality concerns. This can save your money and provide peace of mind on the health of your system. Finding Same day duct cleaning Frankston South services? Need a same day duct cleaning service? We at Lotus Cleaning Frankston South will get you covered. We understand your time crunch and would like to help you out in a way to minimize the duration of the duct cleaning process. We advise you to avail our same day duct cleaning service, our expertise cleaners will make your ducts seem brand new within a day. Lotus duct cleaning involves the general maintenance and cleaning of heating and cooling system components. We also offer Duct system sanitization and deodorizing, which including with our duct cleaning Frankston South services. We provide completely Eco friendly services. Lotus Cleaning also expert for chemical free duct cleaning Frankston South services. If you have any emergency, we are available for 24/7 duct cleaning service throughout Frankston South. Why Lotus Duct Cleaning Frankston South Services ? We provide same day duct cleaning services: We understand your busy days and therefore offer you same day cleaning service with the same efforts and results. Latest duct cleaning technology: We make use of the latest technology and have the technical know how about the usage for such technology and equipment And when good technology goes hand in hand with experts then great results are guaranteed. We are available 24/7: We are available all around the clock and adjust to your busy schedule.You can avail the service whenever you are comfortable and we will be at your door in minutes. Also, try out our same day service. Fix an appointment now. Environmental friendly: We use eco friendly methods of cleaning not only good for you but the world as well. Usage of harsh chemicals can bring negative results thus we avoid them to the fullest. We are certified: We have certified duct cleaners Frankston South and won't leave you disappointed. We have been doing our job since years and we are aware of what we do so do not worry because your air ducts are cleaned by good professional hands. Affordable costs: Lotus Duct Cleaning Frankston South services seemingly won't make a difference to your pocket as we provide affordable services. Spending on clean ducts means spending on a healthy lifestyle and are you aware that a good working furnace helps in reducing your electricity bill? No regret: You will not regret undertaking this service due to the unexpected results. Because fresh air brings a new balanced state of mind, zen we call it! Our professional and reliable duct cleaners Frankston South combine experience and hard work which results in a superior clean for your ducting system. It felt like a completely new instruments. Satisfied with the services. Team used the latest technology machines to get work done in minimum time with maximum quality. Thanks to Lotus Cleaning. We use the specialized video camera to identify the location and removal procedure. Lotus Cleaning's expert Duct Cleaners Frankston South are well trained in performing their job in an efficient manner. In addition to duct cleaning we also provide the service of dryer vent cleaning Frankston South being. Dryer vent cleaning is important and has to be done especially by cleaning experts and not getting your dryer vent cleaned from time to time can bring out fire. Get best duct cleaning Frankston South with affordable price. If you are finding the best commercial duct cleaner in Frankston South then we have all advanced duct cleaning equipments to give you the best result. If you have any question then please fill our Inquiry form or Contact us on 0425 029 990 for professional or commercial duct cleaning. We use 100% organic green products serving all of the Frankston South! Lotus Duct Cleaning Frankston South is a positive step toward a cleaner, healthier, and more energy-efficient home. Clean, clear air ducts ensure that every bit of output from your HVAC system reaches your living spaces so you can enjoy greater home comfort and lower energy bills. Expert in ducted cooling cleaning, best air duct cleaning, duct vent cleaning & Central Duct Cleaning Frankston South. Our technicians are fully trained and qualified to maintain residential, commercial and industrial AC duct systems. They specialize in all types of ac duct cleaning. Improve the performance of your heating & Cooling system by keeping your air ducts clean. Contact Lotus Cleaning today on 0425 029 990 for your professional HVAC inspection in Frankston South. Lotus Cleaning will make your dirty air ducts nearly as clean as the day they were installed. Keeping your air ducts clean will reduce your heating and cooling expenses, and Lotus Cleaning has the experts to make sure that your air ducts are clean and pollutant free. You can leave your air ducts in our hand because our highly trained duct cleaners will give you the best possible residential duct cleaning service keeping in mind the care for your home we will be performing our task in the neatest and cleanest way possible. We make sure that all the vents and air ducts in your home are thoroughly cleaned and we never leave a mess. Our trained technicians use special cleaning techniques to ensure that vents are properly cleaned. We take the vents apart, then clean the fans and registers as well as all other parts that can be accessed. We also use high technology tools for accessing the insides of the vent. When we find that hand vacuuming of the ductwork cleaning services is required, we make use of special tools driven by a compressor, which whips air into the ductwork to remove all the dirt. When we find evidence of mold in the plastic or in the metal ductwork, we use an approved sanitizer to clean it out. Having a fresh home and healthy home is our guarantee for you and your family. Especially before you move houses it is necessary to get your ducts cleaned so that you can get a feeling of a new fresh home with 100% air quality. Not only your home but your workplace is also important to be filled with fresh dust free air, therefore, we offer you commercial duct cleaning services to make your workspace a healthy one to live in. May it be the duct of a school a restaurant to a factory or an office we will clean it all for you, using our specialized equipment we leave your duct fungus, bacteria and dust free in order to ensure fresh and healthy air. It also improves the quality of the air and makes the busy furnaces run better. Providing a peace of mind to you and your workers is always an option to go for. Now, find the best Duct Cleaning Service in your area, so that you can easily reach your cleaning service provider whenever you need duct cleaning services. We understand, how it's become difficult for you to get nearby cleaning providers when there is some urgent cleaning requirements at your home or same day Duct Cleaning Service. Therefore, we are trying to eliminate such stressful and time consuming research for cleaning companies before hiring it, thus, reducing the gap between our valuable customers and the Duct Cleaning experts. Just call on 0425029990, and get your best quote. Not only get Duct Cleaning, our full range of specialized cleaning services are available for you. Now, return the shiny look back to your home with Lotus Duct Cleaning services at your nearest places in Melbourne. Lotus Cleaning is a local and professional duct cleaning services company in Frankston South to providing indoor air quality solutions focus on air duct cleaning services, dryer vent cleaning, heater unit servicing, carbon monoxide testing, evaporative cleaning, central duct cleaning, HVAC cleaning and all types of cooling and heating system cleaning. Our duct cleaning technicians are certified and use the latest equipment and technology to perform the most effective cleaning of your duct system. Everyone did a great job, from the person answering my call to the gentlemen who came to the house! They took before-and-after pictures of the return air vents and showed me how dirty they were. He then informed me of the total cost and proceeded with the cleaning. The team worked very efficiently and clean while also taking care of the furniture. I am very satisfied with Lotus duct cleaning work. 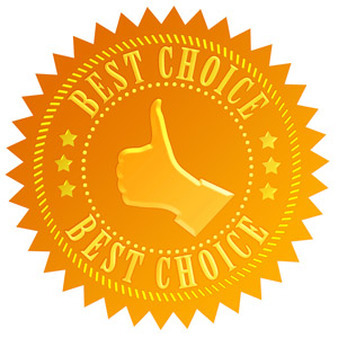 Melbourne's best commercial duct cleaning company as per my review. They didn't take any hidden charges. Well done!!!! Great...fair price, good work, dealt with some surprise repairs fairly and correctly! nice guy as well!